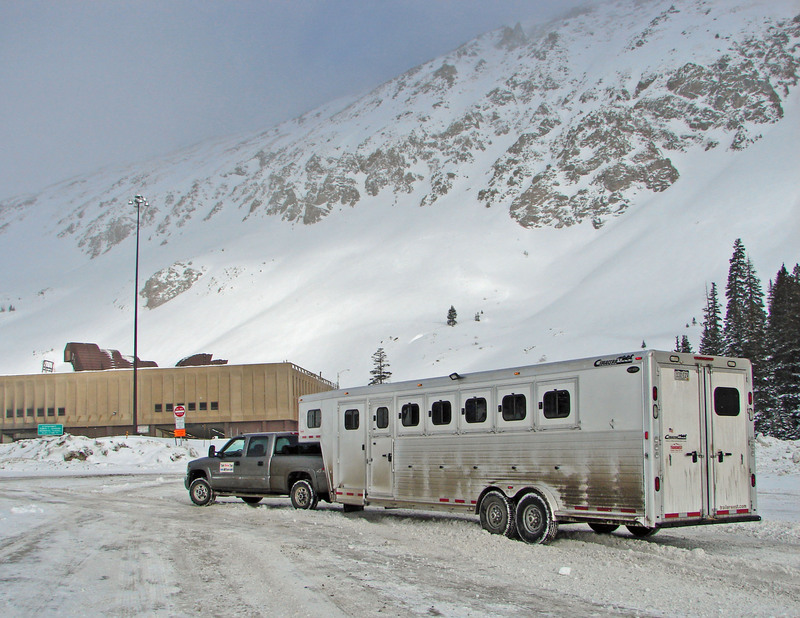 Most of you know what to bring for your horse on your road/camping trip, such as medical kit, shipping boots and such, but what do you need to keep your truck and trailer healthy? I’ve had many road trips and my share of breakdowns in all kinds of weather. I love changing tires in the rain and wind. Pre-trip list of course starts with having your tow vehicle capacity matching your loaded trailer weight plus cargo, fuel and passengers. Read your trucks owners manual to check your payload, axle rating, Gross Vehicle Weight Rating and Gross Combination Weight Rating. If you are using a bumper pull trailer, I highly recommend using a weight distribution hitch with sway control. If your truck/SUV came with a factory tow package, which should include depending on the size of the truck, an external transmission cooler if an automatic, wiring harness for the trailer brake controller, wiring harness to the rear of the vehicle with the 6 pin small or 7 pin large RV trailer female connection and a larger blinker relay. If your vehicle didn’t come with a tow package, that’s the same accessories you need. This picture is me towing a Featherlite SURV North of Vegas, or should I say fixing a flat North of Vegas. Of course the spare was low. So I whipped out my Slime kit with the air pump. The smaller pumps work best with no weight on the tire, so you may have to jack up the trailer/truck to air up. Slime works great, but you do have to let the air out of the tire, pull the valve stem which just unscrews, and then re-air the tire up. I had my aluminum floor jack rated at 6000 pounds and my trusty rechargeable 1/2″ drive impact wrench with impact sockets. Some of the tire shops are ambitious about impacting lug nuts on your truck and it takes equal force to get your tire back off. The rechargeable cordless impact wrenches can be had on the internet for less than $100. The impact socket set is around $30. The aluminum floor jack may set you back $200. So my tools show how spoiled and old I am. Slime kit with air compressor good to have with you for less than $40. Load up with shop towels, duct tape, for teenage mouths, flash light and extra batteries, electrical tape, spot light with 12volt plug, tool box with vice grips, pliers, hammer, wire kit with wire splicer pliers, sharp knife, crescent adjustable wrench, 1/4 and 1/2 inch socket set, screw drivers, crowbar, emergency flares or triangles, WD-40, first-aid kit, fire extinguisher rated for gas and electrical fires, cell phone, even one not connected, 911 always works. You’ll need extra fuses for truck and trailer. Trailer tire chocks and trailer coupler lock will come in handy. You never know if you will have to leave the trailer to get help or more tires if you run over construction or spill. Battery cables and a gallon of antifreeze or water in the summer can keep you going with some breakdowns. I had a small hole in a radiator hose that I couldn’t find coming out of the Rockies and stopped for water at every town. GPS is great if you can afford it. I like seeing the intersections on the GPS before they come up or they still make maps. Lug nuts can loosen on your trailer, if you’re lucky the lug nuts will make a racket bouncing around in the hub cab that you’ll notice. On long trips it’s good to check trailer lug nuts with a star wrench, which tells you to tighten the lug nuts in a star pattern. Get a torque wrench, mine cost $10. 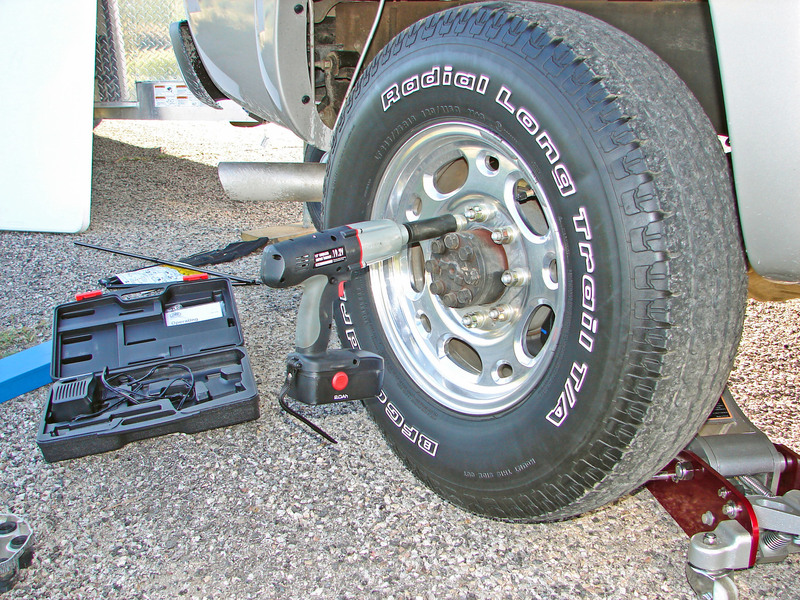 Your trailer/truck owners manual will tell you how much to torque the lug nuts. While you are there, touch the wheel to see if it’s over hot. Which could mean a dragging brake or wheel bearings going out. If you have a 2-wheel drive truck, hope it has limited slip differential so both rear tires will spin when you are stuck and bring some sand in a bag and a shovel if you puddle hop. I drive through alot of muddy fair grounds and national parks camp grounds. Good wiper blades and washer fluid can save your life. Tarp straps or bungee cords to hold fenders off the tire after that last “too short turn.” Include in your tool box, a hack saw and tin snips for a damaged fender. And hope your fender is replaceable. You can be a good driver and still loose a fender now and then going through some tight gates. At least that’s what I’ve been told. I bring my power inverter (picture left) with me for charging my laptop as I download emails on the go, but inverters giving you 110volt on the road has advantages. This one cost $25, is 500 watt with a 12volt and battery connection. Trailer tire pressure is a daily check. Use the max psi it says on the tire when cold. The truck or SUV will have a safety tag on the drivers door frame. Use these numbers instead of what is written on the tire. The truck manufacture decides what is best, also what it says in your truck/SUV owners manual for your receiver hitch rating overrides what it says on the receiver hitch tag. Don’t forget to keep an eye on all those tires for wear. You should not see the top of Lincolns head on penny in the groove on the face of the tires. Check the trailer floor inside and underneath. It’s one of the worst kind of accidents you can have, if the horse steps threw the floor. It’s important to pull the floor mats and keep the floor clean. Trailer emergency breakaway box and cable should be tested along with the battery. Those lovely safety chains needs to be crossed on a bumper pull and double check the coupler is latched. Raise the trailer jack all the way up, remove wheel or stand too. At some point you will come across a dip going in a gas station or off-road going to a trail, that will test anything hanging down. Check lights, wrap bare wires with electrical tape. Check weather on the radio and state police or patrol have 800#’s to check on weather and road closure. Traveling in winter in Colorado, means I call those numbers from the road often. On my trips I tow 500 miles a day. Summer is full of construction which takes more time and patience and winter has just too short daylight. Truck maintenance means checking fluid levels, even the battery. Change fluids (engine oil, transmission oil, differential oil, power steering oil, and brake fluid,) more often towing a trailer. Your owners manual should have a “severe duty or towing interval that’s shorter than “normal duty.” I’m lucky, my Paint mare is highly motivated by feed. If I just say “food” and point to the trailer, she’s in. But practicing loading and the reverse until it is smooth is important. If your trailer has torsion axles, there is very little wear. If shackle leaf suspension, (shown in the picture, left), you need to check everywhere there is a bolt. The equalizer hanger wears and the hanger plates all wear along with the bolts. So drag out the jack out and take the tires off and inspect. Then have them replaces with torsion axles. You’re horse will thank you. Torsions have a better ride. I’ve replaced alot of hangers, plates and bolts each year until I smarted up and switched. Get the WD 40 out of your tool box and oil or grease the hinges on trailer doors, drop down feed doors and ramps. Trailer bearings should be cleaned and packed each year except for perm lube bearings. Trailer brake controller if the trailer isn’t self contained should be a top model. Don’t go cheap on a controller. There is a difference in speed and brake pressure. My top picks are BrakeSmart and Prodigy. Can’t have too much water for the horse, washing the dog and for cleaning wounds on the trail. I’ll have a review of self contained water bowls for inside and outside of your trailer in future reviews. Jacks for the truck, my favorite is an aluminum floor jack because it balances easy and is light. A hydraulic bottle jack is good, cheaper and takes less space. The scissor jacks that come with your truck or SUV, can work but are generally flimsy. 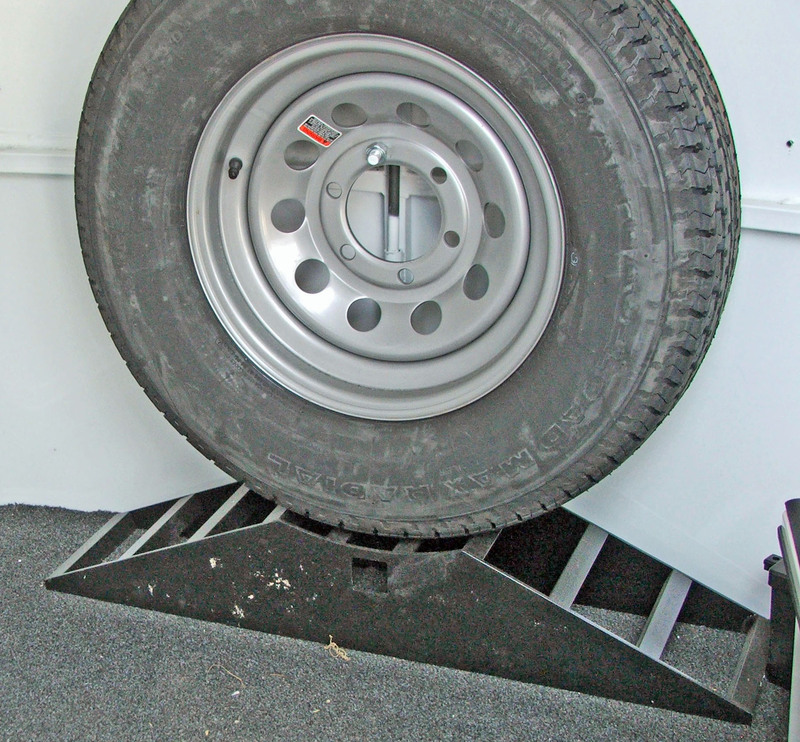 The drive up trailer jack/ramp (picture right) is a fast way to change trailer tires. I also recommend www.USRider.com , I call them AAA for horse folk. They will come rescue you, your horse and your rig. Oh yes, do put in the latest insurance card and registration.